The New Mexico Cancer Care Alliance (NMCCA) is a 501(c)(3) science and education charitable organization. NMCCA is a network of the healthcare institutions and approximately 90 cancer treatment physicians in central, southern, and northern New Mexico. We are steadily expanding throughout the state. The physicians come from both private practice and these major healthcare systems. Our mission is to provide local access to innovative clinical trials for the prevention, screening, diagnosing and treatment of cancer through a statewide partnership. NMCCA will provide educational opportunities and raise awareness of the role clinical trials to allow patients to receive cancer care, in their own communities. Local clinical trials in New Mexico would allow patients to remain close to home while receiving care from a physician they know. Travel costs would be minimized and patients would benefit from having a support group of family, friends, and loved ones nearby during treatment. Many physicians do not have the time or resources to open and manage research studies. Local medical practices typically do not have staff to identify possible study trials and complete the necessary paperwork. NMCCA is available to assist with these administrative tasks and to provide a staff member to help review and enroll patients. NMCCA has expanded its network to ensure appropriate trials will be available in each community. NMCCA is a single entry point for contracting and managing oncology trials for sponsors at multiple sites in New Mexico. NMCCA works with the National Cancer Institute (NCI) and private organizations to bring clinical trials to the state. NCI-sponsored studies usually provide physicians with greater access to new investigational anti-cancer agents. Through NMCCA, community specialists can gain access to these agents, enroll patients in clinical studies, and treat them according to the required research protocols in their own New Mexico-based practices. To learn more about the advantages of opening an oncology clinical trial in New Mexico with NMCCA and for answers to questions trial sponsors frequently ask, please click here. NMCCA sponsors events and also partners with other groups to help patients understand and participate in the management of their disease and learn about the latest cancer treatments available through clinical trials. 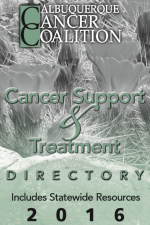 NMCCA is a member of the Albuquerque Cancer Coalition, a group of 25 cancer support and treatment organizations dedicated to informing the community about available resources, educating and advocating for patients, and meeting the needs of cancer patients and their families. The NMCCA web site provides links to other local and national cancer organizations. Our community newsletter focuses on one type of cancer per issue. Each issue also provides information about upcoming events and health care public policy developments. NMCCA’s Helping to Enhance Research in Oncology Program (HERO) provides access to to the latest information on cancer research for the public and medical professionals. The NMCCA Professional Education Outreach Program provides seminars for New Mexico cancer specialists and staff members. These sessions, which frequently offer continuing education credits, feature national experts on the diagnosis, treatment, and prevention of various types of cancer. Through these sessions, medical professionals can learn of new standard-of-care developments and be better prepared to adhere to the best clinical practices when caring for patients. NMCCA firmly believes that the knowledge gained through current cancer research studies will someday provide the answers that will allow physicians to prolong remission, improve the quality of a patient’s life and even find a cure and prevent some cancers.